For additional resources see also the Economics discipline page, the Geography discipline page, the Political Science discipline page, the Sociology discipline page, the Student Tools page and the Writing page. Recall Warnings: This site features information about recalls of consumer products, including food, drugs, clothing, appliances, equipment, vehicles, pet care products and autos. Also provides links to information about the 2003 California gubernatorial recall and to state voter recall provisions. Includes opportunity to sign up for e-mail alerts. Browsable by category or date, or searchable. From book publisher Nolo. FreeLunch.com: Sponsored by the consulting company Economy.com, this site provides access to thousands of pieces of economic and financial information in either chart or table form. Data taken primarily from various United States government publications. Browsable topics include demographics, international trade, employment, crime statistics and more. Also searchable. Free registration required to download data. RePEc [Research Papers in Economics]: A collaborative effort of over 100 volunteers in 41 countries to enhance the dissemination of research in economics. The site provides a database of bibliographic records with links to thousands of working papers, journal articles, software components, book and chapter listings, and other resources related to economics. IDEAS provides access to the complete database, or browse and search specific database sections. Yahoo Finance: This site for investing and personal finance provides US and international stock quotes with minimal delay when markets are open, as well as historical stock quotes and other market information. Additional investment topics include general financial news, industry news, annual reports, and mutual fund, bond and option information. Also includes links to more than 20 international sites. Personal finance subjects include loans, insurance, and taxes. For a good site on all sorts of economic issues (and links to other economic sites) go to www.economy.com. Check out the Layoff Calculator on the right side of the first page. Corporate Library: Research, study and critical thinking about the nature of the modern global corporation, with a special focus on corporate governance and the relationship between company management, their boards, and their shareowners. Association Central: includes contact information on over 15,000 trade and professional associations. Benefits.gov Website: The official benefits website of the U.S. government informs citizens of benefits they may be eligible for and provides information on how to apply for assistance. Find more than 1,000 Federal and state benefits including housing, food/nutrition, education, grants/loans, disaster relief and Medicare/Medicaid. A Predictable, Secure Pension for Life: Defined Benefit Pensions: provides easy-to-understand information on traditional pension plans: what they are, how they operate, and the rights and options of participants. A generation of old people is about to change the global economy. They will not all do so in the same way. Are aging and the economic slowdown linked? The Antitrust Laws are enforced by both the Federal Trade Commission’s Bureau of Competition and the Antitrust Division of the Dept of Justice. Both the National Association for the Advancement of Colored People (NAACP) and the National Organization for Women (NOW) fight political, educational, social, and economic discrimination. The USDA (United States Department of Agriculture) publishes a weekly Weather and Crop Bulletin found under Today’s Reports on their home page. Visit the US Dept of Labor to look at the Current Employment Situation Summary. The Beige Book is a report on current economic conditions published eight times a year by the Federal Reserve Systems. Each Federal Reserve Bank gathers anecdotal information on current economic conditions in its district through reports from bank and branch directors and interviews with key executives, economists, market experts, and other sources. The US Census Bureau constantly tracks the Latest Economic Indicators. Each year the President through the Office of Management and Budget sends his proposed budget to Congress. However, the House of Representatives and the Senate have their own opinions about what the budget should be. The FDIC (Federal Deposit Insurance Corporation) Institution Directory (ID) system provides demographic data and financial profiles for each FDIC-insured institution. The ID system can be used to identify and list FDIC-insured institutions and compare individual bank performance and condition ratios with statistics published in the Quarterly Banking Profile. 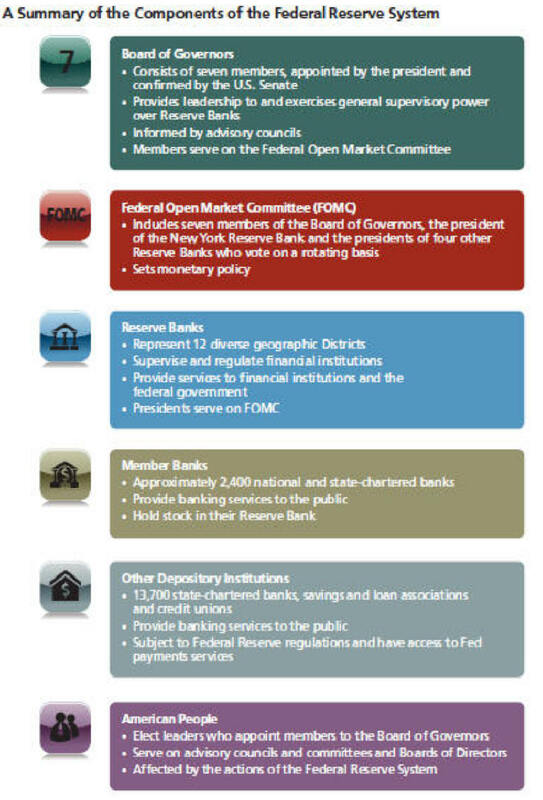 The Federal Reserve System has an Inventory of Historical Materials (PDF) to enhance transparency through improved web access to records of the Federal Reserve's past. The Federal Reserve provides an Aggregate Balance Sheet for commercial banks in the United States and for several subgroups of banks: domestically chartered, large domestic, small domestic, and foreign-related. Balance sheet detail is limited mainly to bank loans and investments; estimates of the major deposit and non-deposit liability terms are provided for each bank group. The release is published weekly. The Federal Reserve District Bank Index has links to each district bank's web site. The Federal Reserve Annual Report provides an extensive overview of the U.S. economy for the previous year. Visit the Reports to the Congress section to retrieve the current annual report (in Adobe’s PDF format only). The US Department of Agriculture Market News reports up-to-the-minute information on Commodity Prices, Demand, Movement, Volume and Quality. The US Census Bureau compiles information about Poverty in the United States. Stock Market Terminology: This web page has an extensive list of stock market terms and their meaning. America’s Career InfoNet accesses national and state-level occupational and economic trends data. Includes job market and employment trends such as what occupations are growing or shrinking, which labor markets are strong or weak, average wages and salaries paid by type of occupation, and what kind of training is needed to qualify for various jobs. US Patent Full-Text Database offers all U.S. patents issued since 1790, in the form of searchable patent numbers and current U.S. classifications hyperlinked to full-pages images of each page of each patent. The Investor's Clearinghouse teaches about investing and the financial markets. The site discusses investing basics, stocks, bonds, mutual funds, online investing, financial planning, and how to avoid becoming a victim of stock market fraud. Index of Economic Freedom is a practical reference guide to the economies of 161 countries, with detailed information about economic policy.